Social CRM Needed To Make Sense of Consumer Data. Social data is overwhelming. More customers, buyers, and consumers are creating content everywhere they go. Companies cannot scale to match this in a 1:1 basis, and most companies are in early phases of the 8 Stages of Listening. Earlier this year, I made clear investments in researching the Social CRM space and Mobile+Social space (report forthcoming), it’s clear that Social CRM is starting to get wind under it’s wings, and mobile/social is certainly happening at consumer level. So what do I see happening next? Two trends, social analytics intelligence, and social business value networks, which I’ll discuss at a later time. 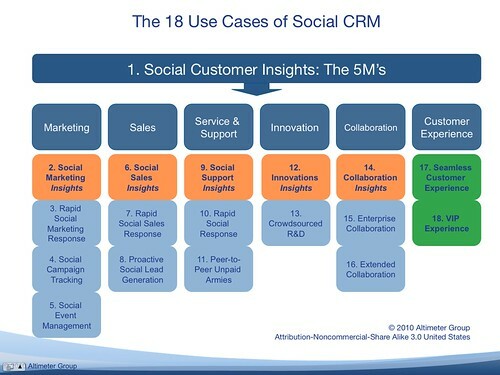 The above graphic lists the Social CRM Use Cases (read the full report). I’ve highlighted the insights use cases (orange) which will yield predictive customer experiences (green). Social Analytics and Social Insights are Components of the Social CRM Suite. You can see how we indicated in the toolset there are use cases in Social Marketing Insights, Social Sales Insights, Social Support Insights, Innovations Insights, Collaboration Insights. If you can successfully derive insights from these 5 use cases, you’ll be able to complete the far right use cases and provide a VIP experience to customers –before they’ve ever entered your store or registered to your website. Brand Monitoring Aware. Simple aggregation and reporting –without any real intelligence. These technologies scrape and aggregate what’s being discussed by a topic, channel, or group and derive alerts and workflows. Commodity technology. I started a list in 2006, yet now there are over 145 indexed by E&Y employees. These technologies do not provide intelligence, or predictive behavior modeling. The smart brand monitoring companies have already started their integration plans. They don’t want to end up being trilobites and have become part of a larger system: Recent acquisitions include Scoutlabs+Lithium(community), Filtrbox+Jive(Community), Techrigy+Alterian(WCM) and others. Corporate Social Strategists Should Evolve Buying Criteria Now. Brand monitoring companies who don’t evolve are on the path to becoming trilobites. Instead, look for companies that will help derive intelligence from the excessive data source of social –not just provide monitoring and reporting. Ask them to expose their product roadmaps before buying, look at their partnerships, and ask how they will derive meaning –not just extend alerting. Expect social analytics and social insights, to emerge within the next year and a half, and many brand monitoring companies to evolve or perish as the BI incumbents move in. Love to hear your perspective as companies seek to derive meaning –then predict customer behavior using social data.